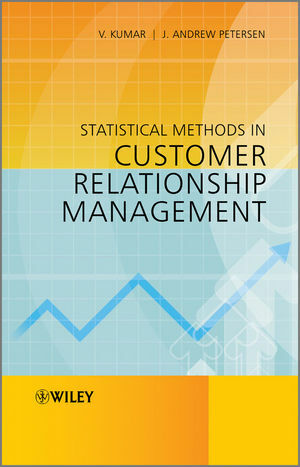 Statistical Methods in Customer Relationship Management focuses on the quantitative and modeling aspects of customer management strategies that lead to future firm profitability, with emphasis on developing an understanding of Customer Relationship Management (CRM) models as the guiding concept for profitable customer management. To understand and explore the functioning of CRM models, this book traces the management strategies throughout a customer’s tenure with a firm. Furthermore, the book explores in detail CRM models for customer acquisition, customer retention, customer acquisition and retention, customer churn, and customer win back. Provides an overview of a CRM system, introducing key concepts and metrics needed to understand and implement these models. Focuses on five CRM models: customer acquisition, customer retention, customer churn, and customer win back with supporting case studies. Explores each model in detail, from investigating the need for CRM models to looking at the future of the models. Presents models and concepts that span across the introductory, advanced, and specialist levels. Academics and practitioners involved in the area of CRM as well as instructors of applied statistics and quantitative marketing courses will benefit from this book. Dr. V. Kumar, Center for Excellence in Brand and Customer Management (CEBCM), and Director of the PhD Program in Marketing, J. Mack Robinson College of Business, Georgia State University, Atlanta, USA. Dr. J. Andrew Petersen, Marketing and Assistant Director for the Center of Integrated Marketing and Sales (CIMS), Kenan-Flagler Business School, University of North Carolina at Chapel Hill, USA.